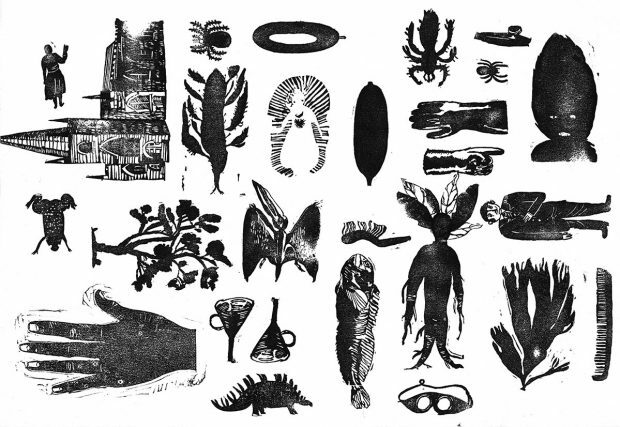 Stephen Fowler is an artist and illustrator specialising in primitive DIY printmaking with both rubber stamps and roller printing technologies. 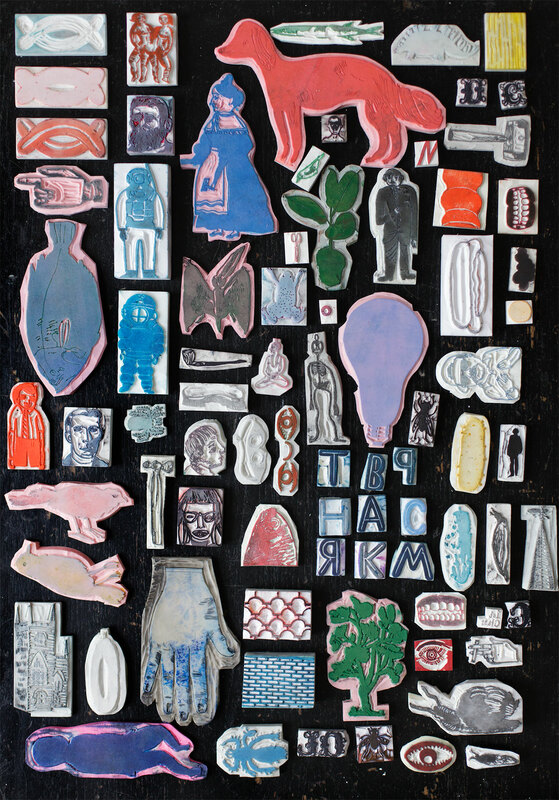 His work is held and exhibited in galleries and museum collections across the UK, Europe and North America. He is a keen teacher of his methods at many popular workshops. His new book shows the joy and simplicity of stamp carving with over forty inventive projects and step-by-step examples. Stephen talks to us about rubber stamp artwork. 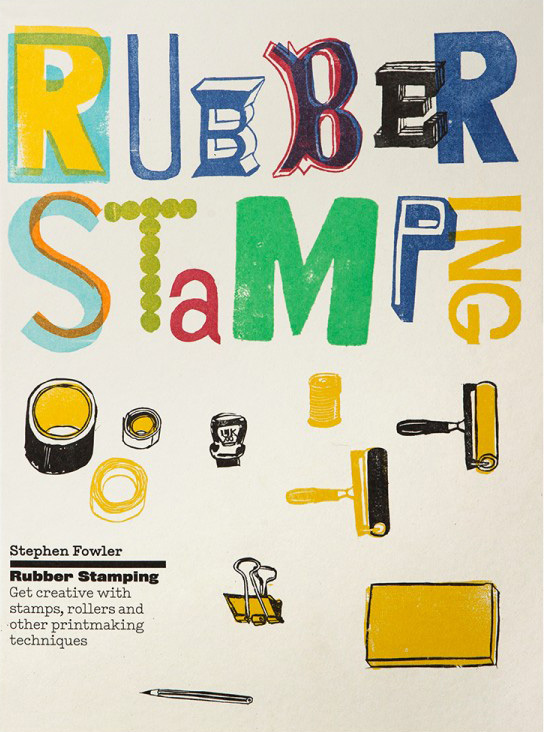 The Rubber Stamping: Get Creative with Stamps, Rollers and Other Printmaking Techniques book by Stephen Fowler features over forty inventive projects and step-by-step examples. 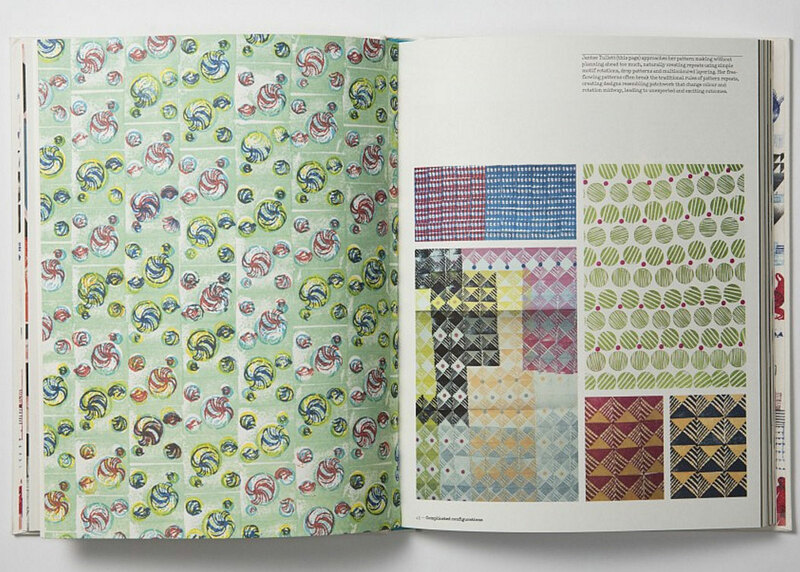 These include designing typefaces and repeat patterns, collaborative mail art, creating books and zines, printing on cookies, body art, graffiti, making portraits, translucent and 3D artwork. It provides a complete guide to printing with rubber stamps: what equipment to use, how to carve your stamps, how to register multiple colours, and mask prints. The illustrations throughout the book are very clear. I found really useful the sections on creating single and multiple coloured relief prints using rubber stamp masking and the skill of accurately positioning stamp prints. 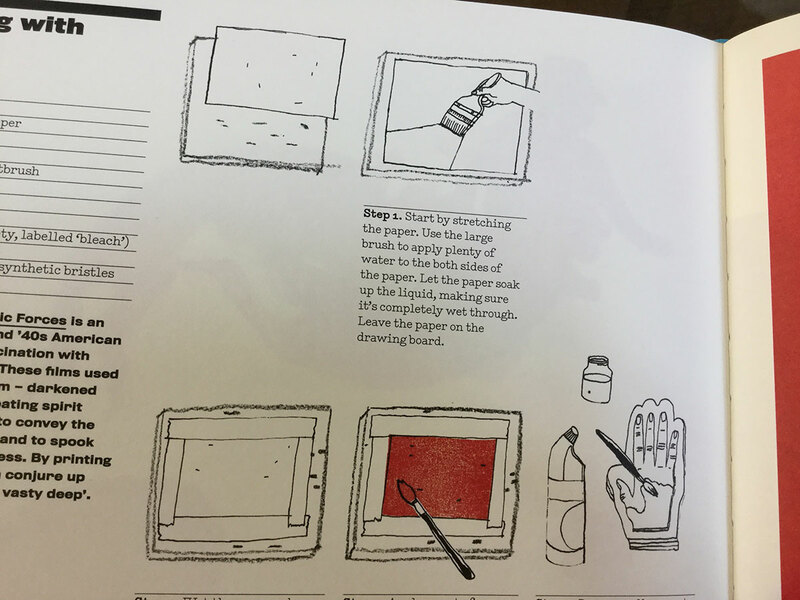 Most of the book covers carving and using rubber stamps but the last section of the book features several alternative printing methods, or what Stephen likes to call ‘primitive printing processes’ including Roller Printing. Stephen Fowler’s art practice has focussed on rubber stamping and DIY printmaking for the past 15 years. Stephen specialises in public engagement using life drawing, book making, printmaking and rubber stamp making and he has run collaborative and experiential workshops at the Whitechapel Art Gallery, Birmingham Library, the V&A, the Wallace Collection, Hayward Gallery’s Wide Open School, and Margate’s Turner Contemporary. 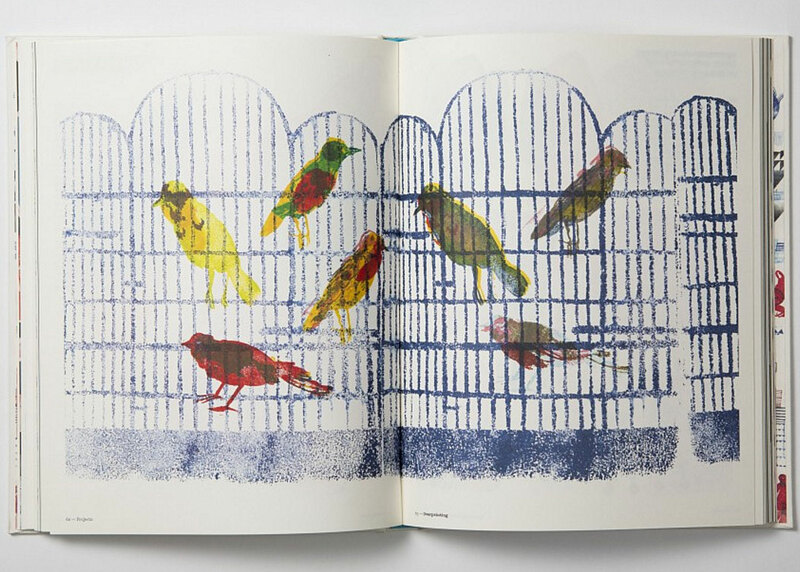 He is a lecturer on Worcester University’s Illustration degree course, a visiting lecturer at UWE’s MA print course and runs master classes in the summer months at the University’s Centre for Fine Print Research. Stephen has worked with many UK/International galleries and artists, including Jeremy Deller for The Strawberry Thief exhibition at the Fine Art Society in 2011. 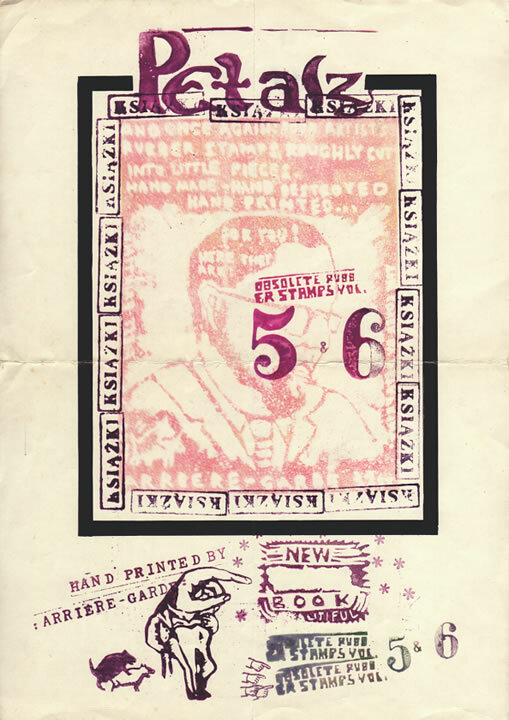 Stephen’s zines and artist books are held in collections around the world including the Tate Gallery and the Victoria & Albert Museum in London, White Columns in New York, and Arnolfini in Bristol. Julie: Many people don’t realise the potential there is in carving an eraser for rapid printmaking and illustration. Even those who already love stamps aren’t aware that they don’t have to buy ready-made stamps. How would you describe the type of stamping you do, to help everyone understand better? Stephen Fowler: Nearly everyone’s got the means of rubber stamp production in their pencil case: an eraser, scalpel, pencil and maybe even a stamp pad, all that’s needed is something to print on. When choosing an eraser the common misconception is ‘better find a large rubber, the bigger the better’ but this is an error. Unlike linocut printing and other forms of relief printing, it isn’t purely a means of reproducing a motif, picture or design. Working with small to medium sized erasers forces stampers be creative, inventive. A brick stamp can print a wall, a house, street, town and even a city. Stampers aren’t confined to the print room/studio, stamping’s a portable medium, you can take it anywhere, print anywhere, not just on paper but walls, food, human bodies for instance. Julie: A carved stamp is beautiful in itself, but its potential is fulfilled when it is used to apply ink to a surface. What do you like about making art in this 2-step way? Stephen Fowler: It’s the constant surprises one encounters, it’s not a mechanised process, every print will be different according to pressure of the hand, amount of ink, type of surface, etc. I enjoy exploiting this characteristic; under inked/poorly printed clouds are ideal for pipe smoke and an over-inked face conveys an embarrassed complexion. Julie: What is your process, what art do you make with the stamps you have carved? 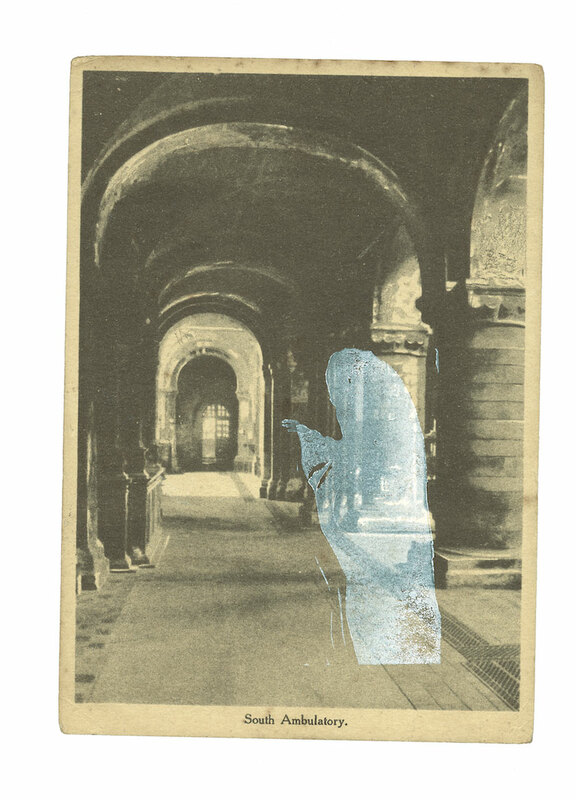 Stephen Fowler: One of the common factors in the work is process, by that I mean I like to play and exploit the strengths and so called weaknesses of the stamping medium – printing with white pigment leaves a translucent ghost-like impression, so ideal for making phantoms appear on a postcard for instance. At the moment I’m interested in exploring the medium as an official form of language. Stamps are often used to validate passports, official documents and the like. On the way to work, quite recently, the ticket collector stamped my ticket so I could travel cross country on any train and at any time, I find that interesting. I love that the means of this official form of language can be redeployed by the counter culture (think of those John Bull printing sets in zines, and DIY record covers) to question the ‘system’. Stamping can be exclusive, kept at a distance and inclusive, arms open in nature. Alongside my carved stamp practice I also enjoy collecting interesting commercially made stamps, especially stamp sets (I brought a great Eskimo set last week) and I’m very fond of formal educational stamps from the 1950s to the present day, French school stamps are particularly striking. I’m planning to employ these stamps as a counter point to my more organic carved stamp impressions in a series of limited edition prints. Julie: Do you make stamps for things other than art, for practical purpose? Stephen Fowler: Not at the moment, however I have plans to make stamps to label my 7-inch record collection. I have about three thousand to box and categorise. 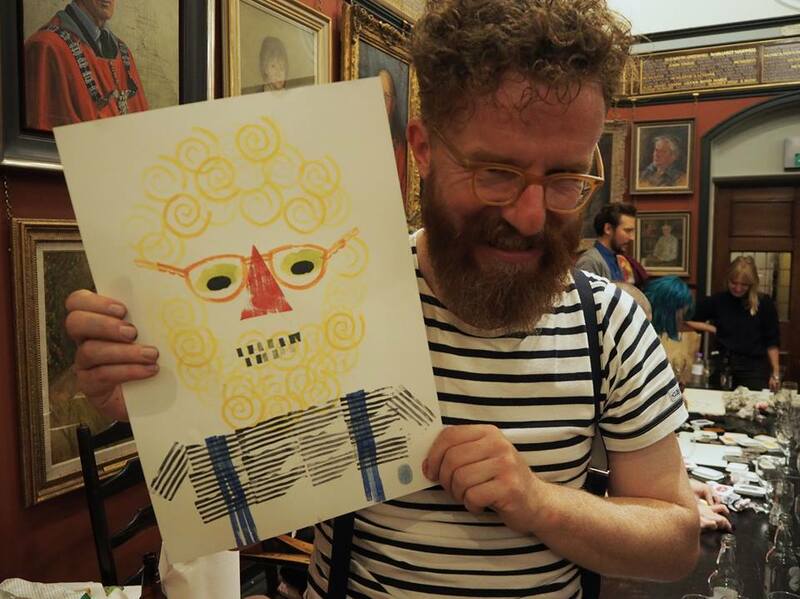 A portrait of Stephen Fowler made with rubber stamps by a workshop participant. Julie: Do you make art without rubber stamps? Stephen Fowler: Yes, although not very often, my world is centred around stamping. I try and find time to make prints with adapted paint rollers, these are made from either pipe lagging or scaffolding foam (depending on size of roller). They are excellent for making speedy repeat patterns, editioned prints and graphic artist books. I draw a lot, and during the summer months I’m planning to make a life-size papier mache model of Grover S. Krautz, a renowned scientist who studied the North American Bigfoot during the 1970s. Julie: What is a good day in the studio? Stephen Fowler: When I’m able to shake off any expectations of the end result of a project or print and just play and see what happens. Having a number of days in a row, no distractions so I am able to get really deeply into something, working late and a 15-hour day helps, too. Julie: You often teach in public places. 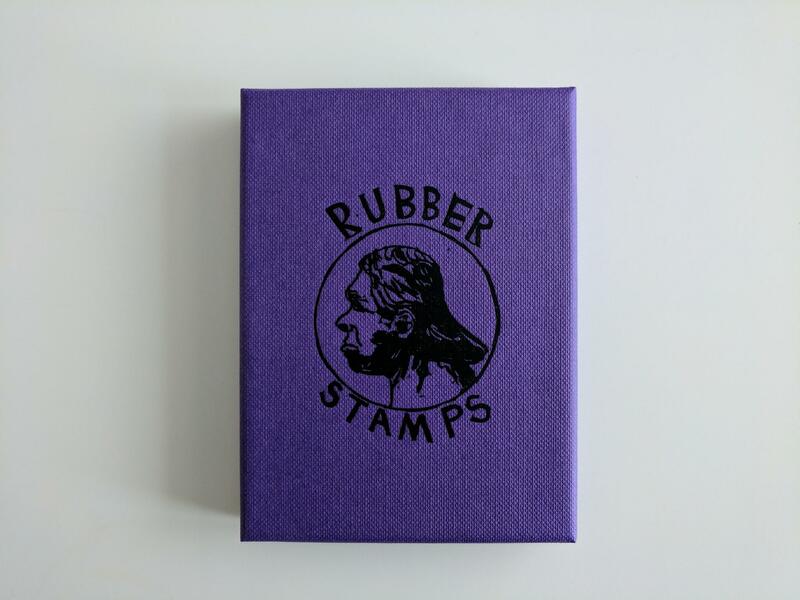 Why do you think rubber stamping makes for such good public workshops? Stephen Fowler: When I ran a workshop in Bristol’s Arnolfini to mark the launch of my book, over 100 people attended, there was a great energy and immediacy in the air. 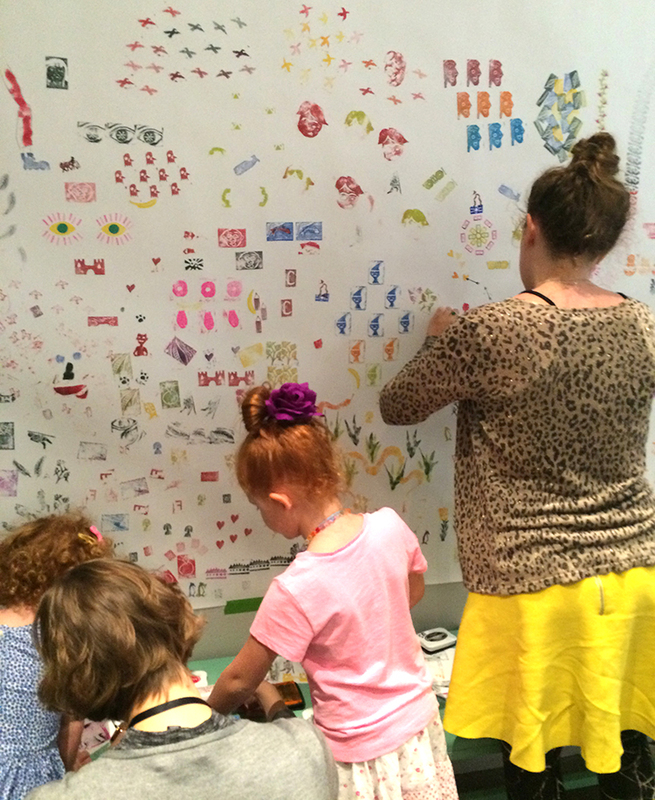 We hung large rolls of Fabriano paper on the walls for visitors/participants to stamp on. Rubber Stamping is so inclusive and adaptable that everyone had a go, 4-year-old’s to 90-year-old’s, the results were simple, effective, graphic and immediate. In this case the size and scale of the work had impact, people liked seeing all the different criss-crossing and interacting results. 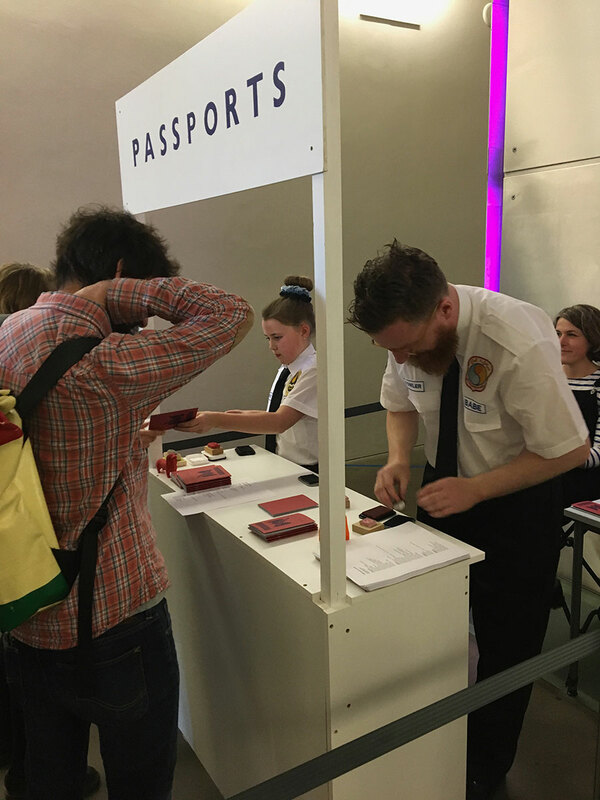 Julie: You were Passport Controller at Bristol Artists Book Event (BABE) at Arnolfini, Bristol in April 2017. Many of the artists made stamps for the visitors to collect in their booklets. Could you tell me about that project? Stephen Fowler: This project came about from a couple of different strands of inspiration. For quite some time I’d been thinking about the authoritative nature of rubber stamps and wanted an opportunity to explore this. I’d also recently brought a book on Japanese Railroad Station Rubber Stamp – each Station or even public institution in Japan has a rubber stamp available to the public to use and stamp in railroad stamp books or maps. 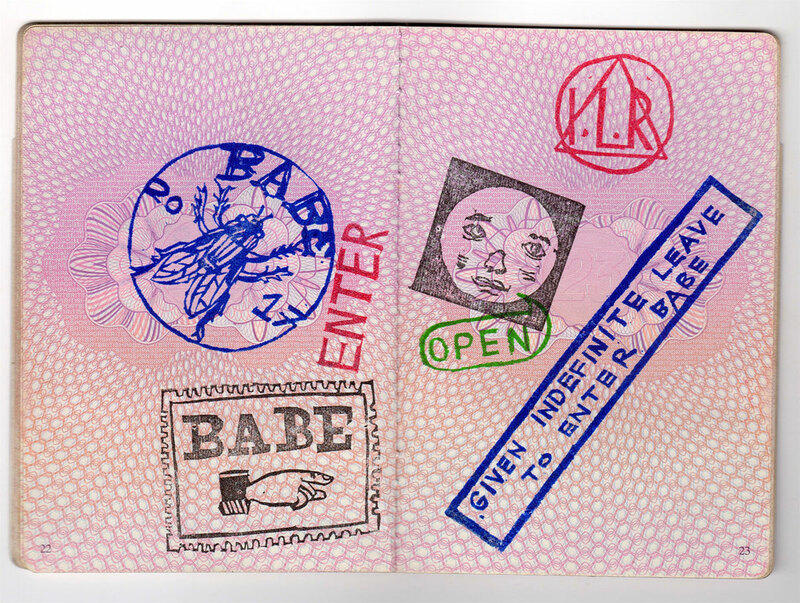 The BABE passports worked in a similar manner, a means to move the visitors about the galleries and collect stamp impressions from the artists, each stall had a rubber stamp. Meanwhile my niece and I dressed in passport officer uniforms and validated the passports, this was very addictive! Some people took the passport office seriously, responding in either a subservient or aggressive manner to the this symbol of authority. Stephen Fowler’s Passport project at BABE 2017. Julie: You were part of the BookishNess project at Loch Ness in Spring 2017. Could you tell me about that? Stephen Fowler: This project is part of an going venture organised by Sarah Bodman, senior research fellow at the Centre for Fine Print Research (CFPR) at the University of the West of England. Every year she contributes an event for the nationwide World Book Night (planned by libraries and the Arts Council). In a previous year we read and responded to Margaret Atwood’s the Handmaid’s Tale with a box of rubber stamped cards. This year I suggested the book The Loch Ness Monster by Tim Dinsdale. Dinsdale’s book was a best seller in the 1970s at the height of the monster’s fame. All participants read the book, and responded with Nessie artwork. 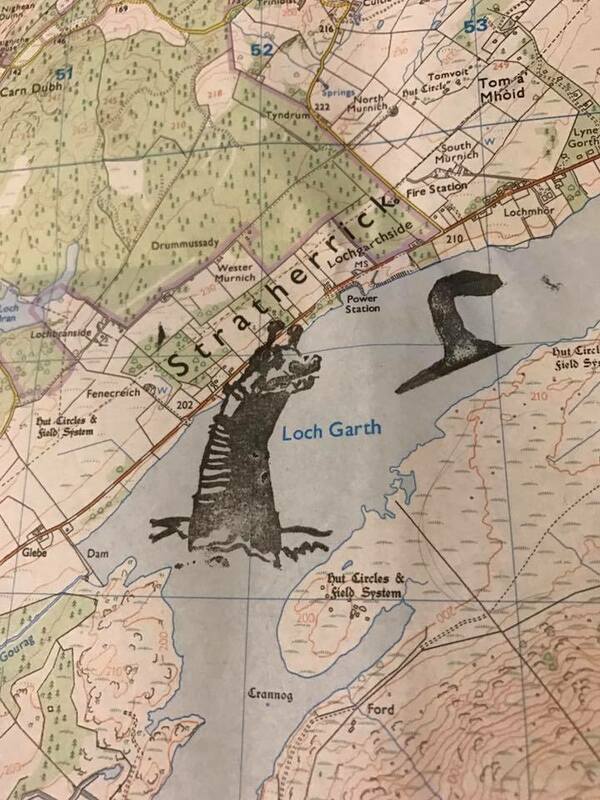 About a dozen of us visited the Loch with the hope of seeing the Monster. Alas we didn’t spot the him/her but we did bump into Adrian Shine, leader of the Loch Ness & Morar Project, which more than made up for it – he’s been running field projects in the highlands since 1973. 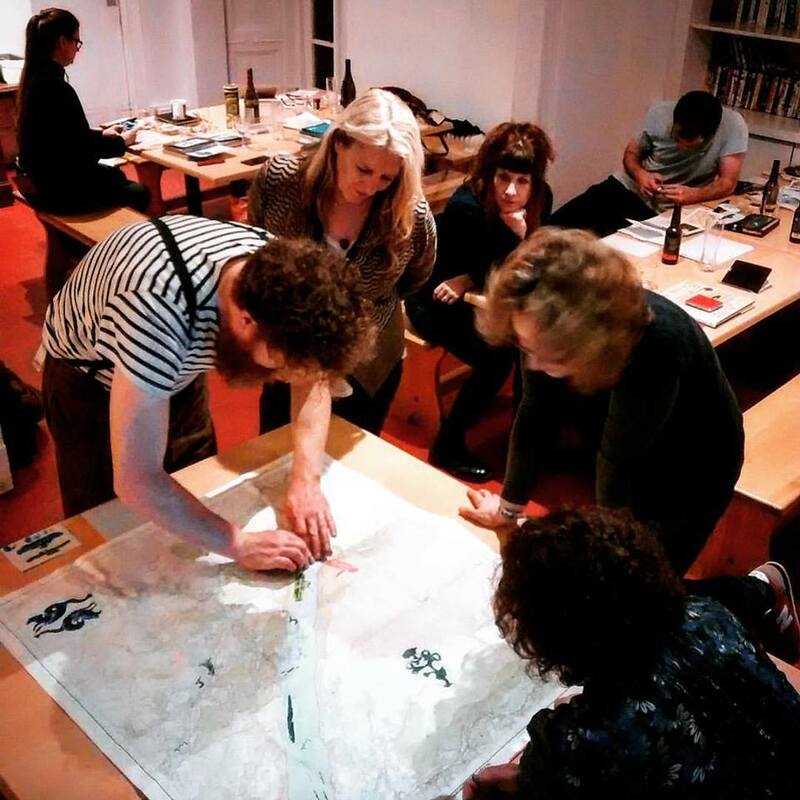 Evenings we complied a rubber stamp map of the Loch, wrote notes, edited photographs and films, all of which became the bare bones of the artist book “Bookishness”. Julie: You create a lot of Mail Art, what do you love about it? Stephen Fowler: I love the immediacy of it, and the surprise of original physical artwork coming through the letter box. It’s in direct contrast to the vast majority of our correspondence we receive via the web, which might explain why it’s such a magical experience. 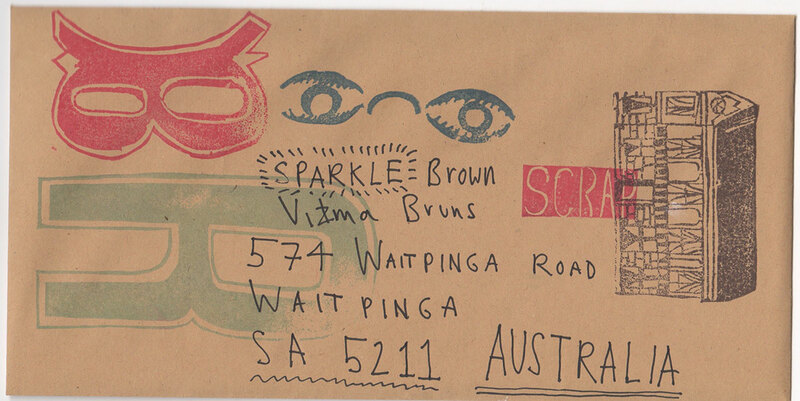 Mail/Correspondence Artists are a generous breed and keen to circumvent the gallery system to exchange art across oceans and countries – try it, send some mail today! Julie: Who are your favourite contemporary artists? Stephen Fowler: I’m in awe of the Polish rubber stamp artist, Pawel Petasz. Known for his prints created during the cold war, when all print production was carefully regulated and even basic art materials were in short supply, Petasz used materials at hand, such as potatoes, erasers and floor lino to make his art. He’s still making rubber stamps prints to this day. Last year I come across the Japanese Rubber Stamp Artist Natsuko Oshima’s work on the web. 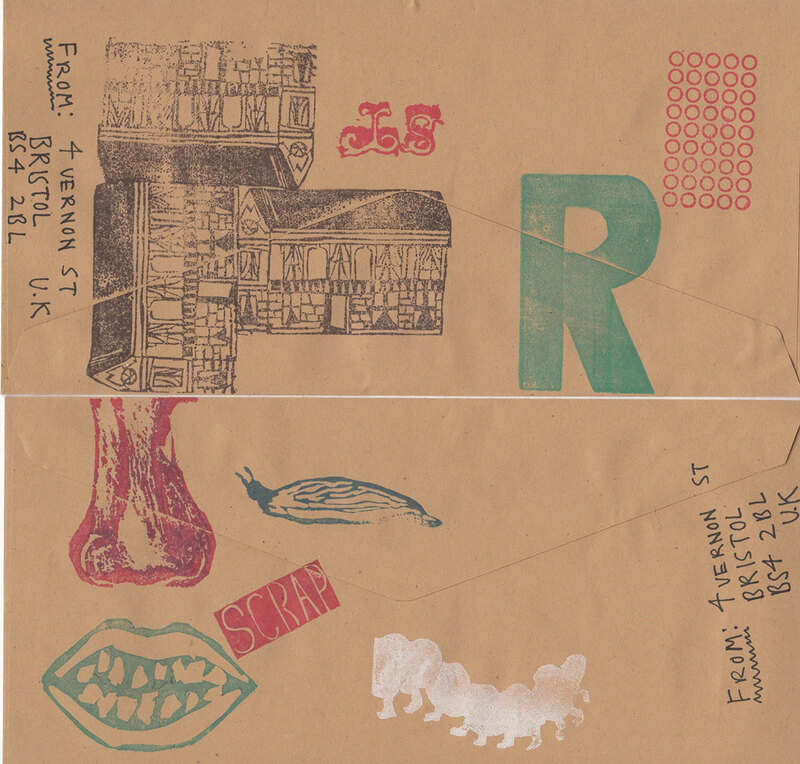 Her stamps are a combination of sensitive personal observation (being reportage in approach) and a utilitarian style. I can imagine them stamped in architectural plans. Her recent publication, ‘Tokyoite Stamp’ is a wonderful thing, and worth seeking out. Lastly the Illustrator John Broadley, I love his raw brutal drawings reproduced via Xeroxes, they’re the visual equivalent of hearing rock n roll on a small transistor radio. Last month I brought a copy of his limited edition book, ‘Everything’ll be Alright’, featuring pages of drawings ‘inspired television plays and films made in the UK during the 1960s and 1970s. Julie: What is coming up next for you and where can we see more of your art in the flesh or on-line? 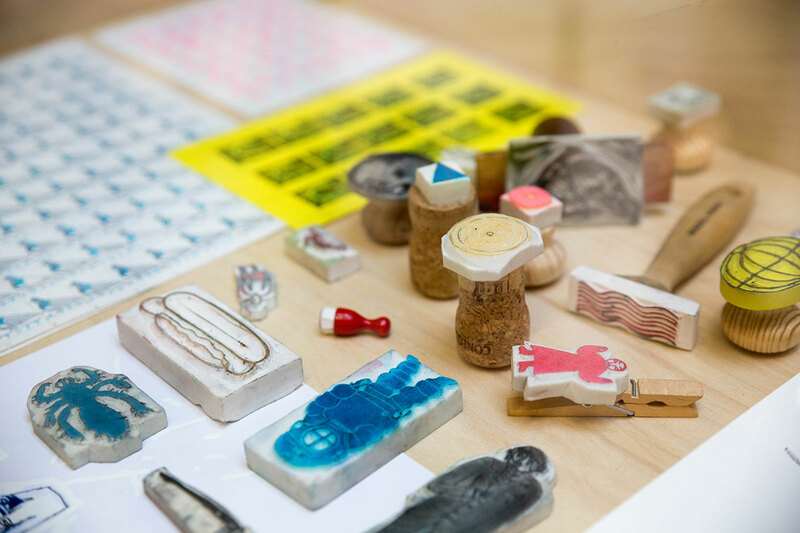 Stephen Fowler: This summer I’ve been invited to be the first artist in residence to explore the Minnesota Centre for Book Arts new stamp archive, it comprises over 70,000 stamps, the joint archive of Scott Helmes and William “Picasso” Gaglione’s extensive Rubber Stamp collections. In the autumn I’ll be busy running workshops, a 2-day rubber stamp workshop at Graffix in Antwerp and my Wildman life drawing class at Stockholm’s workshop festival GÖRA! And Craig Atkinson’s Café Royal books is publishing a very limited edition box book multiple of my work featuring a book, and original rubber stamps prints in November. Rubber Stamping: Get Creative with Stamps, Rollers and Other Printmaking Techniques book by Stephen Fowler is available at jacksonsart.com where the huge selection of books for artists are always discounted off the cover price. Postage on orders shipped standard to mainland UK addresses is free for orders of £39. 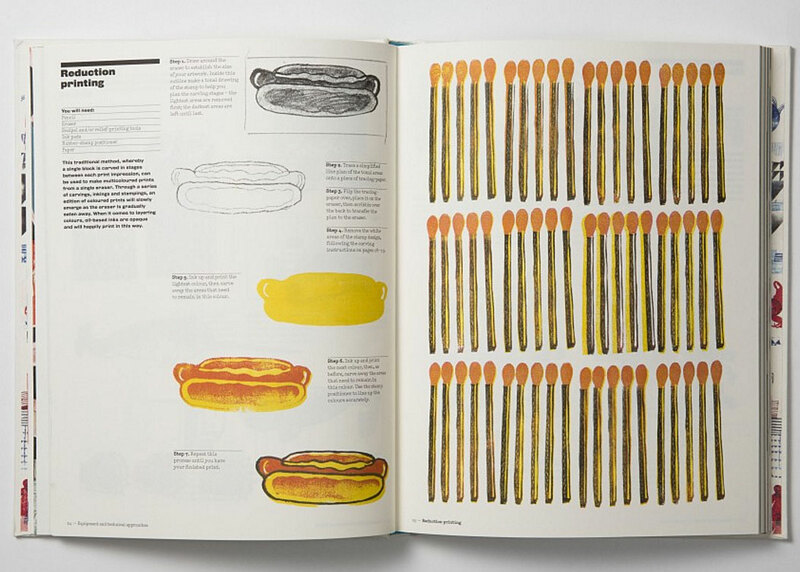 Take a look at the hundreds of other titles in the Jackson’s Art Book Department – all of the titles are 20 to 30% off cover prices everyday. You will find that we usually have the lowest prices out there! Julie has been editor of the Jackson's Art Blog for 10 years. With an encyclopaedic knowledge of art materials (majoring in oils and acrylics), she loves researching and writing pieces for the blog as she learns something new each time. Julie is also a professional artist, a recent graduate of the Turps Studio Programme and previously studied at Camberwell.